The first rain of the fall season has arrived, which means it’s time to refresh safety tips for driving in the rain. Drive at speeds safe for conditions. Wet roads and hard braking can cause people to lose traction and spin out of control because their speeds were unsafe for the roadway conditions. Keep a safe distance while following a vehicle. Keep a light touch on the break and gas peddles. Gently decelerate to slow down, especially on turns. Don’t accelerate too hard to avoid fishtailing. to turn them off after you park). • Check your tires for proper tread depth. • Ensure all your lights are working, i.e., headlights, taillights and brake lights. Take your time, and enjoy the cooler weather. 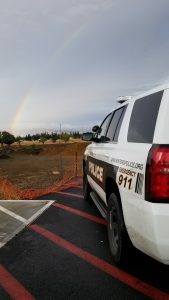 Officer Barajas spotted a rainbow this morning after the first rain of the fall season.